1. Royal Caribbean, the cruise line that knows the Caribbean the best offers a fabulous 4-night excursion from Port Canaveral on the Monarch of the Seas, stopping in Cococay and Nassau. 2. 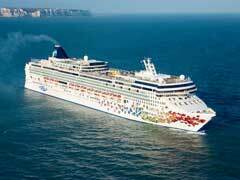 Carnival offers 3 day cruises from Miami to the Bahamas for that quick getaway to the sun. Cruise the fun ships and stop in the heart of the action in Nassau. 3. If you are looking for a weekend away, the Norwegian offering is for you. Roundtrip from Miami to Nassau, this cruise lasts just two days, for a mini-vacation to paradise. 4. Bahamas cruises from Ft. Lauderdale can be had from Holland America on their 10-night sailing, the Southern Caribbean Seafarer. Stops include Half Moon Cay, Grand Turk, Kralendijk and Orenjestad. 5. Princess Cruise Lines Southern Caribbean 7 day round trip sailing goes from Ft. Lauderdale and stops in Princess Cays, Curacao and Aruba before heading for home. 6. Princess also offers a 20-night cruise roundtrip from Ft. Lauderdale with stops in Nassau, St. Thomas, Dominica, Grenada, Aruba, Antigua and Barbuda, Barbados, St. Kitts and many other ports of call. 7. A cruise to the Bahamas from West Palm Beach is offered from the Celebration Cruise Line. This 6 night trip includes 4 nights on land at their Our Lucaya resort, as well as two nights cruising. 8. Costa Cruises are a smaller line and offer a 10 night cruise from Miami that encompasses Florida, the Bahamas, Jamaica, The Cayman Islands, Honduras and Mexico. 9. Bahamas cruises from Jacksonville are offered by Carnival. Four nights on the Carnival Fascination that stops in Freeport in the Bahamas. 10. Royal Caribbean’s Allure of the Seas sails from Ft. Lauderdale, with stops in Nassau, Charlotte Amalie and Philipsburg before returning to the states. Florida cruises to the Bahamas can be quick getaways or longer vacations depending on your needs, but will all take you to fun in the sun in style. Whether you like the fun ships, freestyle cruising or want to try another line for a change, Florida cruises to the Bahamas has you covered.